This stitch pattern has a lot of horizontal stretch, but because it is a brioche stitch, the stitch is compacted vertically. 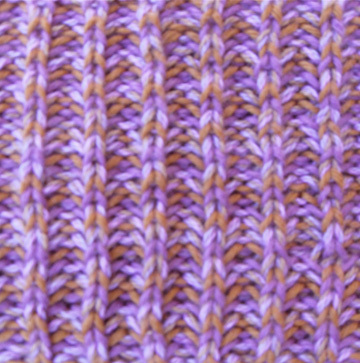 The use of 3 alternating colors, helps add visual interest, but this pattern can be done with one yarn, as well as a mixture of many yarns. For making a long scarf, cast on at least 211 stitches, or any larger uneven number and leave ends free (as fringe). In this way, you can use this pattern as a stash buster. 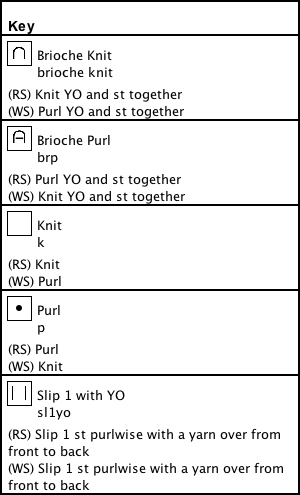 This chart can be used to see how 3 different yarns [CA (color A), CB, and CC], used alternately, only repeat every 7 rows. The pattern is started on the wrong side (ws). This is just for use of the chart, as the pattern is reversible. Set up Row 1 (ws): Using CB (k1, sl1yo) to last stitch, k1, UNDO - the slip knot, that was used to hold the yarns together (so you don't accidentally use it as a stitch). 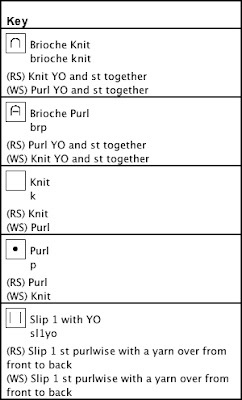 Bind off (ws): Using CC, and the Kitchener Stitch, bind off the brks as knits, and the single stitches as purls.